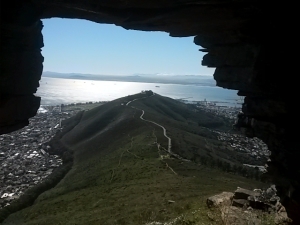 One of the most popular hikes in Cape Town is Lions Head. This is the small “Sugarloaf” peak alongside Table Mountain. You can be up and down in 2 hours and the views from the top are magnificent. 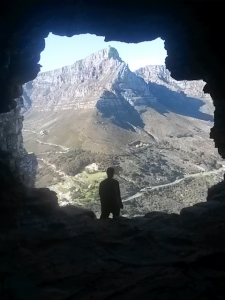 But by getting slightly off the beaten track you can enjoy some really special views from some of the caves on the way up. The views of Table Mountain itself are amazing. One of the greatest things about the Lions Head hike is the circular trail that ensures you get a different view ever 15 minutes. 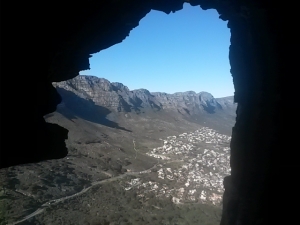 This cave is found right on the other side of the mountain and has views of Signal hill. All these caves can be reached with very little effort and its just great to sit and relax in them for a while.